Student extracurricular activities are an integral part of the educational experience at Putnam Academy. We offer a variety of clubs geared to provide our students with opportunities to develop mental and physical stamina and social skills required to realize their potential as citizens. Future Farmers of America (FFA) is an intra-curricular organization for those interested in agriculture and leadership. Members develop their unique talents and explore their personal interests in a broad range of agricultural career pathways. Members of 4-H Club learn by doing. Under the direction of the County Extension Service, students complete hands-on projects in areas such as health, science, agriculture, and citizenship. Adult mentors provide guidance and encouragement to students as they take on proactive leadership roles. In Anti-Bullying Club, students share personal stories about bullying and join together to develop and promote ideas for making our school safe, secure, and free from stereotypes, intolerance, and hate. Students in Yearbook Club use an online computer program to create yearbook pages and take on the primary responsibility for taking pictures selected for the yearbook. Students selected for Yearbook Club must demonstrate well-developed writing and social skills and should have taken, or be registered to take, photography as one of their elective courses. Builders Club is a service organization for middle school students who learn to work together and develop servant-leader skills as they serve their school and community. 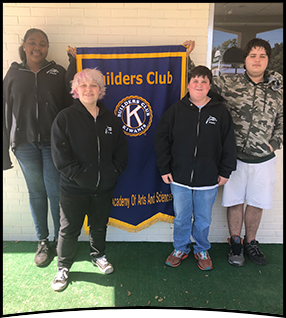 Sponsored by Kiwanis International, Builders Club fosters the development of strong moral character and loyalty to school, community, and nation. We invite students who maintain a 3.75 GPA or higher to join Top Dolphin Club. Members promote academic achievement, character development, leadership, and service learning at school and within the greater Putnam County community. Journalism Club students use well-developed writing skills to promote Putnam Academy through newspaper articles, social media posts, and school newsletters. Students Working Against Tobacco (SWAT) educates and unites students against the manipulation and targeting of youth by tobacco companies. Members work to de-glamorize tobacco use and to empower students towards a tobacco-free future. Girls Get IT Club is available to talented 7th and 8th grade girls with an interest in math and science. This club exposes girls to STEM-related careers through hands-on lessons, mentoring activities, and field trips.